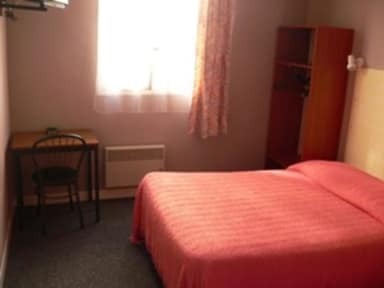 Close to the metro and train station and very friendly staffs. Good cleanliness as well. 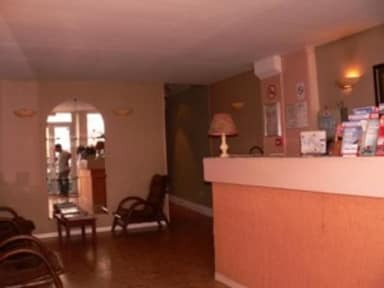 The hotel is located very convenient near Gare de l‘Est (less than five minutes to walk). Less than half an hour to l’Île de la Cité afoot or 15 minutes with the Métro. The hotel manager was very friendly and helpful. I suggest that you return to the hotel not too late as there are some strange people around the train station at night. The room and the bathroom were small but clean. For its cheap price the hotel really offers alot especially the location and the friendly staff is great. This hotel is located in a good place but not the safest district. Staff was nice and understanding. However their English wasn't very good. What is more wi-fi was very slow and weak. The worst thing in our stay was blankets. Each of it was dirty and full of dusts. Both rooms caused us breathing problems and allergies. This hotel is good choice if you want to pay not much and room is needed just to sleep, not to spend days in. Nice, friendly, and helpful staff. However, there were bed bugs. No frills, no fuss two star hotel. My only complaint was that it reeked of cigarettes. Very convenient location next to the train station. Consider another place next visit. The staff was friendly. You have to return your key to the front desk whenever you leave. Not comfortable with that security. Bathroom was dirty and stuffy. There was mold on the shower head. When we came back after a long day the beds were all made and the window was wide open. I was surprised the bed actually comfy beds once you get over the atmosphere. The location was ok but we still had to catch a metro everywhere, the ibis budget was roughly the same price and I wish we'd have stayed there. With it being so hot we had to keep the windows open as there's no fan or air con. The noise that came from the building next door was so loud every night, so every morning all we wanted to do was sleep, which ruined the trip a bit. I'm usually an "it'll do as long as there's a bed" person, but all three of us found it hard to sleep.